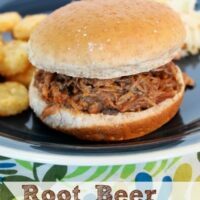 Root Beer Pulled Pork Sandwiches - Dessert Now, Dinner Later! I am trying to get on board with some slow cooker recipes since it is getting ridiculously hot nowadays. I am just not super “crock pot savvy.” I tend to overcook things in the crock pot, & not everything is good or a pleasant texture when converted to a slow cooker. Meats are usually my safe bet, & this pulled pork was super easy & tender. The root beer & sauce helps make up for any dryness in the meat & this was enough to feed my small family for days! We used the meat for sandwiches & quesadillas. Yummy! Spray the inside of a crock pot with pan spray. Season pork roast with salt & pepper & place inside the crock pot. Pour can of root beer over the roast. Cook on low for 6-8 hours, or until shreddable. Shred meat. Save 1 cup of the root beer liquid from the crock pot, & discard the rest. Return the meat & 1 cup root beer liquid to the crock pot. 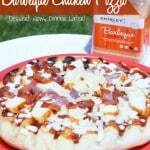 Add bottle of BBQ sauce. Mix thoroughly. Heat mixture for another 30 minutes. Keep warm. 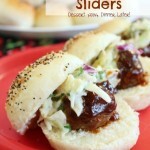 Serve on a hamburger bun. Yep, we definitely had the same idea for dinner last week! I love using root beer for pulled pork. One of my favorites! 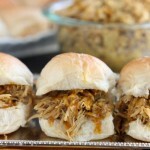 I adore my crockpot and use it all the time…pinned to try these later! What Crock pot do you use? I have a rival and it runs to hot. I have both a rival and crockpot brand slow cooker. Just watch it if you know it runs hot and lessen the time. Sometimes longer it goes, the easier it is to shred, and you are adding liquid and sauce to the meat, so you shouldn’t worry too much about it drying out. Yum! how can you go wrong with this recipe! Pinning! Visiting you back from Tasty Tuesdays! 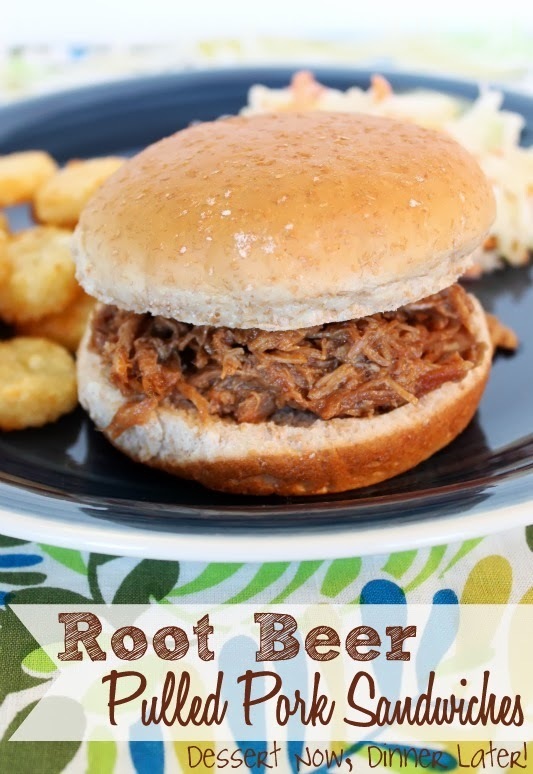 Love the idea of using root beer with pork! 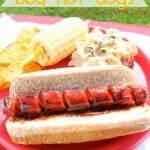 Great crock pot recipe! This just made me so hungry! 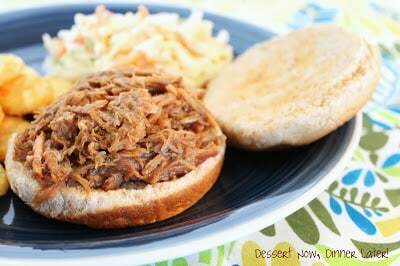 I love BBQ pulled pork! I cannot stand root beer, but my husband loves it! I think this recipe would be perfect for the next time I’m away and need a dinner I could just leave in the slowcooker for him! 🙂 Thank you so much for linking up with me this week at Tasty Tuesdays! I’ve pinned this & shared it with my followers! Please be sure to stop back by the party and check out some of the other links! Love this, got it in the crockpot now!!! I’ll let y’all know how it turns out!! !